Kenyan environmentalist and women's rights activist who was the first African woman to receive the Nobel Peace Prize. She served as assistant minister for Environment and Natural Resource from 2003 to 2005. She majored in biology at Mount St. Scholastica College in Kansas, where she received a scholarship. She won the Nobel Peace Prize in 2004 "for her contribution to sustainable development, democracy and peace." 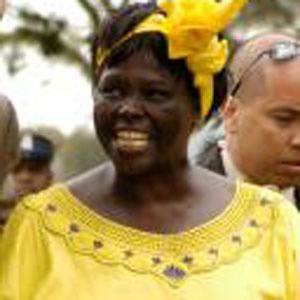 She married Mwangi Mathai in 1969. She met with then Senator Barack Obama when he visited Kenya, the home of his father.